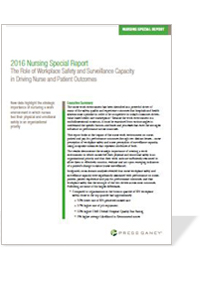 To help health care leaders build and sustain a culture of nursing excellence, we’ve developed our 2016 Nursing Special Report: The Role of Workplace Safety and Surveillance Capacity in Driving Nurse and Patient Outcomes. Data from this paper highlight the strategic importance of nurturing a work environment in which nurses feel their physical and emotional safety is an organizational priority. Complete the form to receive your copy of the report and learn how you can adapt strategies that drive nurse safety and sustain work environments that support excellence in nursing practice. Insights in this paper highlight the strategic importance of nurturing a work environment in which nurses feel their physical and emotional safety is an organizational priority.